A tour of the famous "wedding cake house" gives visitors the real scoop on the Phoenix landmark. Growing up, I knew Tovrea Castle as “the wedding cake house,” in part, because the hilltop structure overlooking the Loop 202 Freeway and nearby Papago Park resembles a tiered cake slathered with butter cream frosting. But, the nickname made sense, too, because my mom told us a wealthy man had built the castle as a wedding gift for his bride. As an adult, I was a little disappointed to learn my mom’s story wasn’t true, but that didn’t dampen my interest in Tovrea Castle. When the City of Phoenix purchased, renovated, and eventually opened it for tours, I decided to find out, once and for all, who lived there. I met my tour group at the visitor center on East Van Buren Street, and our docent, Nancy, began with some background. Originally, she said, the Hohokam inhabited the area but left around 1400 A.D. The land remained largely untouched until F.L. and Lizzie Warner homesteaded it in 1907. Following their deaths, Lizzie’s daughter inherited the land and sold 277 acres of it to Alessio Carraro, a businessman who had amassed a fortune in the sheet metal business, in 1928. Carraro hoped to create a resort destination surrounded by a housing subdivision, Carraro Heights. But, shortly after beginning construction on the hotel in 1929, the stock market crashed. Carraro didn’t let that stop him. He completed the hotel in 1931 but no one had the money to stay there, let alone purchase a lot. Reluctantly, he accepted an anonymous bid for $28,500, one-tenth what he had invested in the land and hotel. At that point, Nancy drove us in a 12-seat golf cart past the original entrance and on to the first of two mounds. On the mound, she pointed out the bunkhouse where Carraro’s workers lived, the machine shop and a pyramid-shaped marker memorializing E.A. Tovrea. 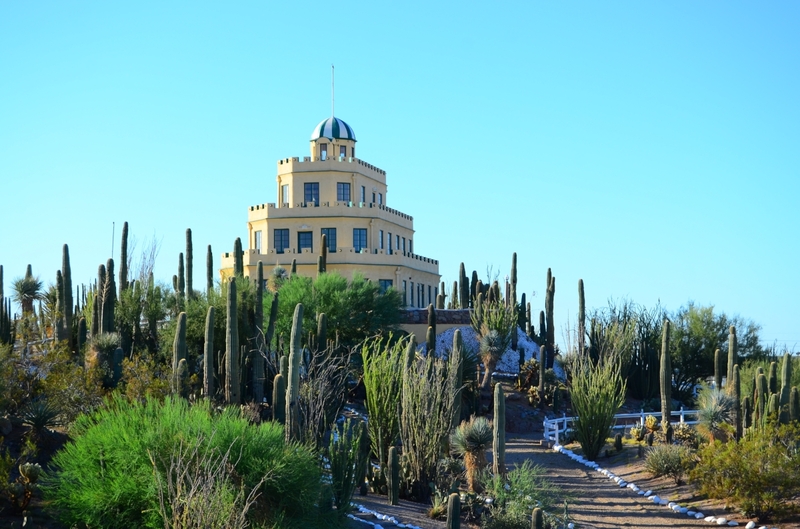 She also told us about the pipe-smoking Russian immigrant who designed the cactus garden and how Carraro’s son, Leo, convinced his father the river rock borders would look better painted white. Next, we drove around the front of the castle to see the remains of a dirt ball court (no one is sure what game was intended to be played here), reflecting pool and horseshoe pit. Below the castle, rusting wire pens once held Della’s mastiffs; on the patio, a remarkably well-kept aviary for her exotic birds still stands. At the second mound, Nancy directed our attention to the well, pigeon coup and off-site Stockyard Restaurant, built by E.A.’s son so cattlemen had somewhere to eat near the stockyards. Circling back to the front of the octagonal castle, we parked. Nancy stopped us at the painted silver bell near Della’s bench—the bell plays prominently in her story—before we entered. For being a “castle,” the structure is surprisingly bright inside. Windows ring the 1,640-square-foot first floor, lending a glow to the original maple floors and cream-colored walls. 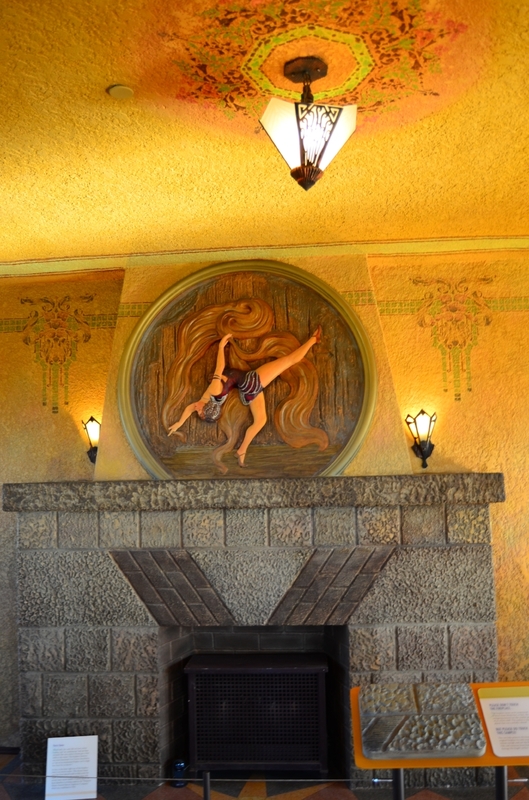 I studied the faux fireplace built by Italian workers who worked on the Orpheum Theater and checked out the display cases containing one of Della’s dresses, chair and other pieces. After they escaped with $50,000 in cash and valuables, Della tried summoning her caretakers, who lived elsewhere on property, by call button and phone. When neither worked, she braved the storm to ring the bell. They still didn’t respond. Finally, she walked to their quarters, but the weather and stress of the robbery were too much. Eighty-year-old Della caught pneumonia and died shortly after that. The nearly 2-hour tour concluded in the basement. 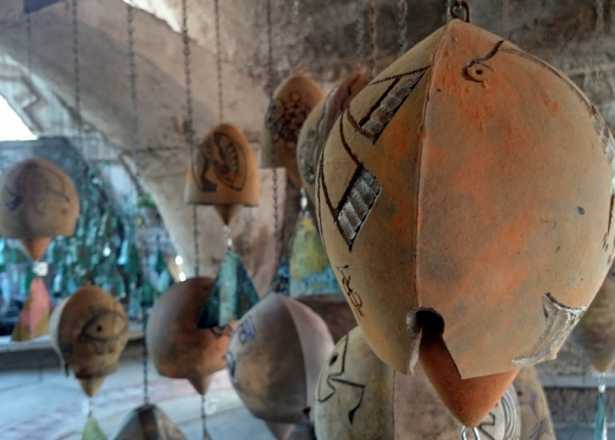 As I browsed the collection of art deco light fixtures, ragged signs, and other artifacts, I thought how different—in a good way—the reality of Tovrea Castle was from the stories I’d heard over the years. 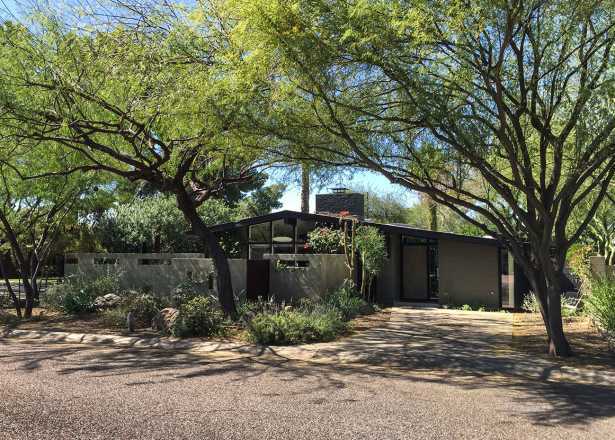 It would always be “the wedding cake house” to me, but now, it was something more, too: a property shaped by the dreamers who helped make Phoenix what it is today. Tickets for tours are not easy to come by. Tours sell out many months in advance and within 24 hours of going on sale. Tour tickets for September through December 2018 will be released on December 11, 2017 at 6 a.m. local time. Teresa Bitler’s earliest memories include visits to the Phoenix Zoo and hikes on Camelback Mountain. After moving away from Phoenix briefly, she returned to the city 20 years ago to raise a family. 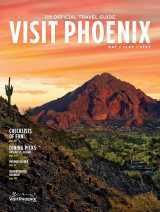 She writes for Valley Guide and AAA Highroads, and is the author of two Arizona guidebooks. 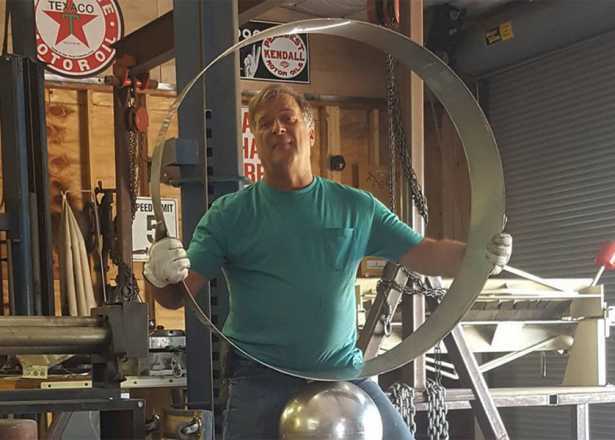 Phoenix sculptor forges scrap metal, railroad spikes and more into memorable works of art.